We have been to this park many many times, and it still is so much fun, it never gets old, it has so many things to do! The Ormond Beach community came together and created this kid designed park, featuring kids art, with an enchanted forest theme. Throughout the park you will find dragons, and knights, and other animals, like lions and giraffe and fishes too. The whole structure is constructed out of wood and also wood/plastic composite pieces for railings to reduce splinters. 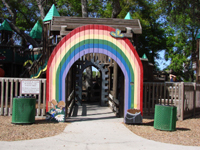 The Magic Forest Playground has mazes and towers and bridges, and secret passages, a puppet theater and plenty of covered picnic areas. The whole park is set in a live oak tree grove which provides shade for sun relief year round. This park is great, and I hope you get the chance to visit soon!